The data-crunching fiends over at Five Thirty Eight examined the data from thousands of script evaluations of screenplays by newbie writers, submitted to the Black List of unproduced screenplays. And they found that science fiction and comedies have the worst ratings of all — as well as the reasons why these scripts often crash and burn. 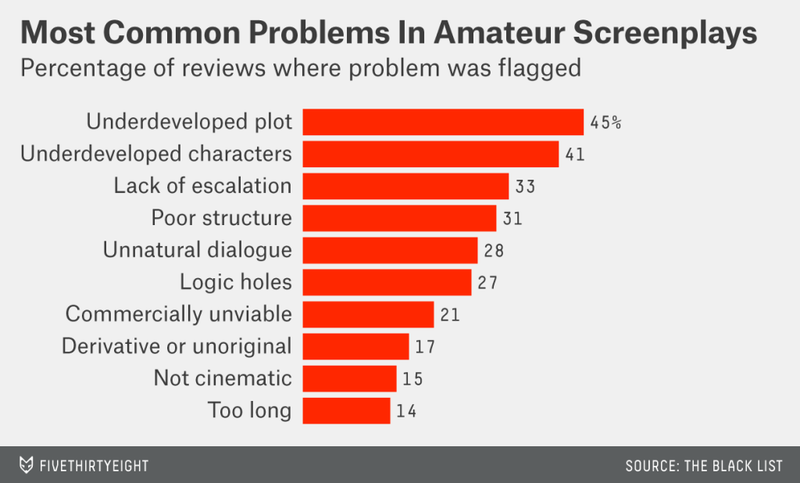 The above chart shows the most common reasons why all amateur screenplays (not just the science fiction ones) are prone to failure. At the same time, since science fiction had the lowest ratings of any broad genre in their analysis, that chart does give some pretty good indications as to why those science fiction screenplays, in particular, are getting low marks. First-time writers tend to go one of two ways, said Kate Hagen, a former reader who now oversees the hundred or so readers at The Black List. They write a deeply personal, pseudo-autobiographical screenplay about nothing in particular. "Everybody basically writes that script at first," Hagen said. "You have to get it out of your system." Or they swing for the fences and go in the opposite direction, thinking, "I'm going to write a $200 million science fiction movie," and plan an entire universe and mythology. Those scripts, Hagen said, tend to fail for entirely different reasons. As it turns out, science-fiction scripts — those for alien invasion films, sci-fi/fantasy comedies and superhero movies — are some of the lowest-performing genres in our data set, and the general category of science fiction and fantasy does worse than the general set in most elements.